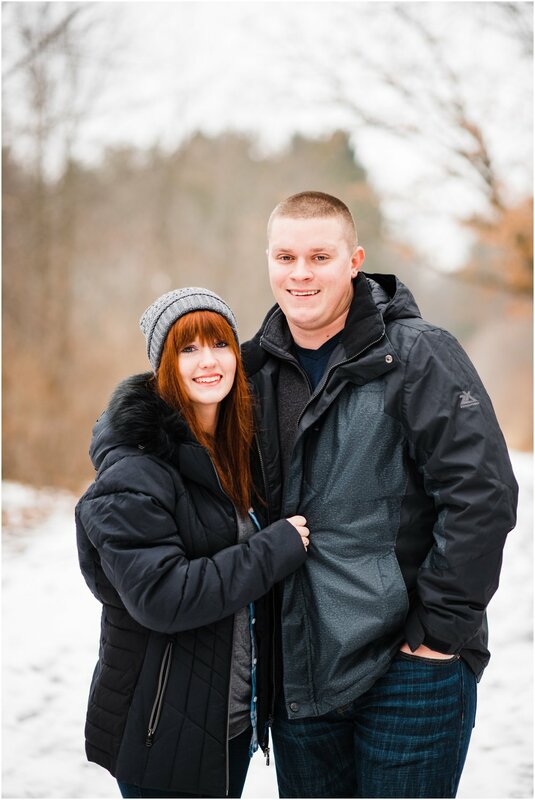 Lindsey was our Winter Engagement Session Contest Winner. Lindsey and Cody made the trip up to Wisconsin from Indiana to partake in the session. I can truly say that these two were amazing during their session. They were laid back and full of smiles. You simply could see the love all over their faces. One thing Lindsey stated to me was she wanted a session outside in nature. So the first place that came to mind was the majestic Devil's Lake State Park. Nothing says outdoors like this park. 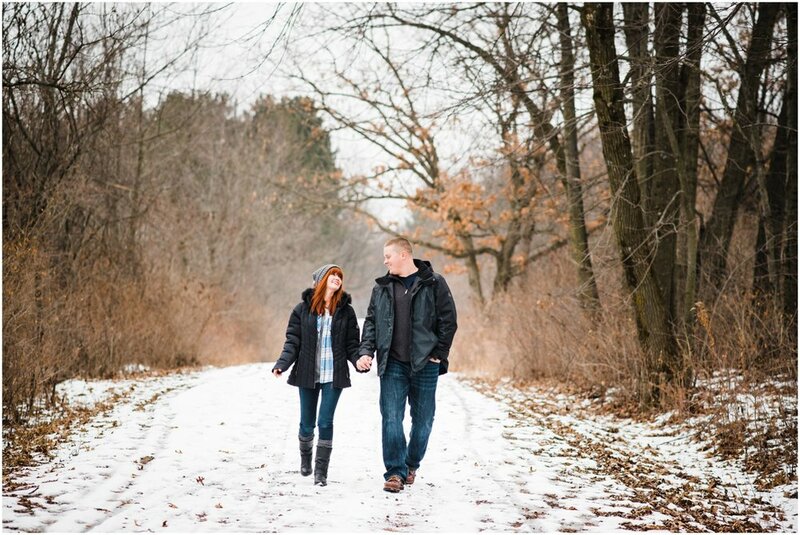 It was cold, over casted and beautiful, but filled with love, smiles, laughter, gorgeous red hair and a frozen lake. It made for a great time. So enough about the day...read below about Lindsey and Cody's love story in the bride-to-be own words. Congrats Lindsey and Cody!! So our love story; it's a loaded story, but Cody and I officially met in 2013. Later I actually learned that we'd met in junior high at the county fair...(crazy to think that I met my soulmate in junior high without realizing it!). We spent so much time together taking road trips, grocery shopping, and watching TV. We really got a chance to simply know each other. During this timeI realized that I really liked him, and he really liked me. However we were both to blind to see the signs we both were throwing out there and we both were just too stubborn to tell each other. Because of the great amount of stubbornness we ended up going our separate ways and seeing other people. In the summer of 2015 I decided to take a chance to messaged him to see how he was doing; but really I did it just to see if he would remember me. After sending that first message we reconnected and basically picked up where we had left off. At that time we both were still being a little gun shy and very hesitant to develop deeper feelings and being in a relationship. This however didn't stop Cody. He officially asked me to be his girlfriend at the end of October in 2015 and a weight was lifted. Over the next couple of years he became my rock and my best friend. I genuinely didn't want to be with no one else and I knew he was the one. As time went on, we constantly joked about different ways to propose. Then one evening Cody told me he'd probably propose with a puppy. So, last spring he surprised me with a puppy, but there was no ring on the puppy. Later in the summer we decided to take a trip down to Williamsport falls, in Indiana. It's there that he asked me to marry him. Which definitely took me by surprise, since I am pretty clumsy and we had discussed that with my luck I'd hit it out his hands and it would be dangerous to do around water. However, I didn't that and it was the happiest day of my life. Now I get to marry my very best friend.